The Australian PM sought to balance trade with South China Sea, investment and cybersecurity concerns. Australian Prime Minister Malcolm Turnbull made his first visit to China last week, visiting Beijing and Shanghai on a two-day trip during which he met with both President Xi Jinping and Premier Li Keqiang. This trip was all business, as evinced by the 2,000 strong delegation during the second Australia Week in China event. But media coverage tended to focus on what the South China Sea meant for Australia-China ties. Australia has always had a two-speed engagement with China, in which strategy and trade compete more often than coincide. It is a given for many of Australia’s political realists that the balance between China’s economic importance and America’s strategic significance cannot be maintained forever. Chinese investment is also scrutinized at times over security concerns, as in the case of the Kidman Station cattle ranch purchase by Chinese investors in November (the sale has just gone through in another form after Kidman carved out a piece of its property close to the Woomera testing facility from the enormous land package). Turnbull brought up what he saw as Chinese aggression in the South China Sea during his first interview as prime minister in September, calling island-building one of its “more counterproductive foreign policies.” Australia has no official stance on sovereignty disputes, save that the rule of law be followed. Turnbull has been more welcoming of China’s rise in general, even welcoming some contest with U.S. hegemony in the past. More interesting for China is that Australia released a new defense white paper in February. Direct references to China’s growth were few (“newly powerful” nations was obvious shorthand). Chinese response to the white paper was to call it a throwback to Cold War time. China may have deep, if not expressed, concerns over Australia’s focus on the maritime (and the possibility of a dozen new Japanese-built submarines). However, these concerns were largely aired by the foreign media.. Xinhua’s take, heavy on quotes from Xi Jinping, looked more at nation-to-nation ties than the importance of business. During Turnbull’s trip, memorandums of understanding on sport (including one on promoting Australian Rules Football, or AFL, in China) and tourism were also signed. It is election season in Australia, a time when domestic politics typically trump foreign affairs. But as the mining boom has slowed, Australia continues to look to China for economic growth, and trade in non-extractables will be key. Free trade agreements with Japan, Korea and now China have been part of the government’s election platform. The deal with China went into force in December last year, and it’s likely that improving trade with China will be part of the campaign for July’s double dissolution election. 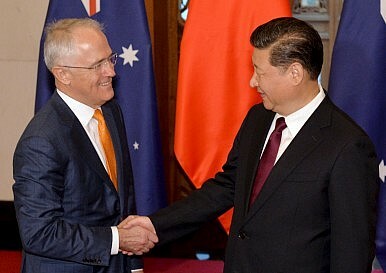 The China-Australia free trade agreement is seen as by far the most important of the three for Australia, and was over ten years in the making. Exports to China are important for domestic politics in Australia; equally, there is deep hesitation over some forms of Chinese investment. Over the past year, some projects have been nixed for security reasons, while others have attracted intense scrutiny and considerable controversy, such as the leasing of Darwin’s port to a Chinese company. Chinese investment in real estate has also been problematic with some refugees from Xi Jinping’s anti-corruption crusade parking their money in large Australian houses. Chinese investment more generally is assumed to have driven home prices up, which benefits sellers but has a deleterious effect upon first time home buyers. Most real estate companies in Australian cities employ Mandarin speakers and advertise via outlets like WeChat, APC or JuWai. These, however, are mere bumps on a long, wide road to an enduring economic partnership, it seems. China is Australia’s biggest trading partner, with trade worth more than A$150 billion ($117.3 billion) for the last two years running. Turnbull’s’ thinking on China runs deeper than the get-rich-quick ideas that have excited many Australian politicians. In 2011, he said in a speech to Asialink in Melbourne, “we have vastly more to gain than to lose from the rise of China, India and the rest of emerging Asia.” And went on to quote an old Chinese aphorism, tong chuang yi meng (which might roughly translate as “strange bedfellows”). What could have been of greater concern is a new Chinese e-tax that will take in Australian exporters, taxing goods at a flat 11.9 per cent. Though this will affect sections of the free trade agreement, as The Conversation has pointed out, other nations will be more affected, though popular online products from Australia such as infant formula or “clean” food may take a hit. Australia and New Zealand will not take sides in territorial disputes, except to say they do not appreciate China’s actions. Which to Beijing means they have picked sides, something everyone knew already. Meanwhile, trade rumbles on. On his first official visit to China, Australia's prime minister downplayed recent tensions in the relationship.